Göran Hugo Olsson’s archival documentary about the anti-colonial liberation struggles across Africa in the 1950s-1970s frames itself as a reading of Frantz Fanon’s seminal The Wretched of the Earth. The director will be present for a post-screening Q&A. 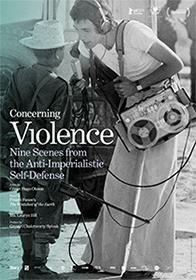 Concerning Violence will screen in H-110 on Monday, November 10 at 7pm. Admission is by PWYC donation. Previous PostThe CGFSSA Presents: “After Life” November 3rdNext PostCongratulations, Dr. Andrée Lafontaine!! !